It has been so fun hanging out with the people here. Over the past few weeks I feel like I have become so close to these people. At the beginning all the kids were on their best behavior but over time we have watched them become more and more comfortable around us. Simon told me one day last week that Winnifred and him will miss me so much when I leave because I have basically become apart of their family which is definitely how I feel. One day this past week Jerica and I went to pick the kids up from school and Sunday decided he wanted to walk there with us. The weather was getting to be bad and Sunday kept telling us it was about to start pouring and we needed to go back before we got wet. The Ugandans are very concerned about us being out in the rain and getting wet. They also do not like when we get dirty. We told Sunday we were fine and that we would be ok. As soon as we picked Winnifred and the others up it started to rain. All of us ran the whole way home. Winnifred did not have shoes on so I let her get on my back and we ran back to her house in the rain. Irene (Winnifreds cousin) was not home so we went to look for her and found her at Conseys. After a little while we decided we should be going back home since it was raining so hard. All the kids followed us. We ended up playing in the streets of Uganda in the rain. We danced, raced, sang and had so much fun! I have not laughed that hard in a long time. It felt so good to enjoy something so simple. Though life here is so simple for these people, they make the most of it and enjoy every moment! Tonny and Sunday have been telling Emma and I that we have to see the dam before we leave. It is where the water comes from that flows into the stream behind the village and runs all the way into town and is their water source. We agreed that before we left we would go. Today was the day. We have been asking them how long it would take to get there and the time has changed every time. Once it was two hours, once it was 30 minutes, once it was an hour, so we just did not know. Ugandans are not very good with time. They say something is close but it is actually hours away. When we told Consey we were going she looked at us like we were crazy and told us it was very very far. But, we decided to go anyway. Emma, Elizabeth, Tonny, Sunday, Barbra, a few other kids and I started off for this dam they have been talking about. We had such a good time hanging out and walking together. We were definitely experiencing Uganda. I truly feel so content being here and have become best friends with so many of these people. I feel like I have known them forever. The dam ended up only being 30 minutes away. It ended up being just a little pond but it was definitely pretty just like everything else here. It was surrounded by a gate with a sign that prohibited anyone from entering. Tonny and Sunday acted like they go in all the time and hang out but in reality they had never actually done it before. They told us they would be right back and went to talk to the soldiers that were there to make sure no one entered. They came back telling us we could go in but were not allowed to take pictures. People here let mzungus get away with things. After walking across the dam we decided we should leave. Instead of going home Sunday wanted to show us his casava garden. He told us it wasnt far at all. Believing him we walked down a trail for a long, long time. We saw many gardens where people were digging. We finally got there and saw his garden. He was proud of it thats for sure. I took a picture of it because he was so so proud. Sunday filled his backpack full of casava and then we started on our way back home. Tonny and Sunday kept telling Emma and I that we were weak mzungus and needed to become stronger. By the time we got home we had been walking for 3 hours. I would say it was worth it for sure! Im glad we went and got to see the dam and the garden and see more of Gulu. Every minute we spend with Tonny and Sunday brings us closer to them and allows us to get to know them more. They are so much fun to be around and I enjoy it so much! I love how every time we are together we always quote the scripture we have memorized together and although we are joking and playing around pretty much the whole time we are together, our conversations always come back down to Jesus and the gospel. Sorry I havent blogged in a few days! A lot has been going on! Everything has been so good with Winnifred. I have walked up on her sitting outside of her house many times reading the Bible and trying to memorize John 3:16. It is very encouraging to see her making the effort and truly wanting to memorize scripture and read the Bible. One morning this week on the way to Kasubi Central (the school that Winnifred and a lot of the kids go to) I asked Winni if she had memorized the verse. She had and she recited it to me perfectly. Her translation said "begotten son" and "perish" so we broke down the verse and I was able to explain to her what it meant. Everyday we recite John 3:16 together on the way to school so she will always remember it. I have encouraged her to memorized more scripture and have told her the importance of it. She is definitely willing to learn which is awesome! Sunday, who I mentioned in an earlier blog, has been one who has genuinely loved memorizing scripture. I give him one verse to memorize one day and almost every time, by the next day, he will have it memorized and will recited it to me and then I will give him a new verse for the next day. We review the old and then recite the new. Memorizing scripture is such an important thing to do. Even when we do not have a Bible, if we have memorized verses, we always have God's word in our hearts and minds. Last night was definitely a fun adventure! To begin with, while we were having devotion we were attacked by "white ants" which are HUGE termites. When it rains these white ants come out by the hundreds. Ugandans collect them, fry them, and eat them. Supposedly they taste pretty good but I have yet to try them. They somehow kept getting in the house. Needless to say, our concentration definitely was not all there. While Sara was washing dishes the water went completely out. So with no power or water, we made a group decision to take a trip to the boar hole in the village where everyone there gets their water. We all piled in Matt's car with our "jerry cans" or our big water jugs and made the trip to the village. We parked and as soon as we got there, kids came running to the car. We all got out and when we got to the boar hole there was a long line of people waiting to get water as well. So, we all just hung out there with the kids playing and taking pictures. We finally got all of our jugs filled and, being in Uganda, we just had to carry them back to the car on our heads. They were extremely heavy. Sunday, one of the boys in the village, had to help me get it on my head and he could not stop laughing at me. It was a good thing we come out to the village so much because by the time we left it was pitch black dark and couldn't see a thing. Annet was walking behind me with her jug full of water on her head and she screamed so loud and said "This thing is squishing me!" haha which made me laugh which did not make carrying that thing any easier. When I reached the car and got it off my head I literally felt a few inches shorter. We all piled back in the car and Matt realized he had broken the car key in half. With no such thing as a spare key in Uganda, he stuck the end of the key down in the ignition and pushed it down with the other half and turned it and it came on! We made it back to the house and then the water came back on! It was definitely worth the adventure though! Winnifred has been telling me about a place on her arm that has been hurting her. I have looked at it everyday to see if it gets worse and it usually looks about the same. It looks like a huge bump on her arm that is very swollen around it. Winnifred's cousin, Irene, has it too and they have both been messing with it a lot. On Friday when Winnifred and I got home from the school Irene was home and had a safety pin out trying to pop it. I told her that probably wasnt a good idea but if she did stick a needle in her arm, she should probably stick the end of it in fire so it would be somewhat sterilized. She understood and left it alone. Yesterday I woke up early to go spend the day with Winnifred. When I walked up Winnifred was popping the spot on Irene's arm and stuff was oozing out of it. It was pretty gross. Winnifred had already popped hers. They told me it felt much better so I guess thats good. Annett told me it was a skin disease and to pop it when it turned yellow so I guess they did the right thing. Winnifed had to dig in her garden before she did anything else so I helped her dig and while she was digging she cut her toe open pretty bad with her hoe and it was bleeding very badly so we washed it off and took care of it as well as we could. I put her feet in my lap to clean it out. Winnifred was a little surprised that I wanted to take care of her dirty feet, but she told me she was very thankful. These people are willing to give us anything they have even if it means that they go hungry or go without. Winnifred went and got me about 5 mangos that her grandmother had bought in town and told me to eat them. It is very rude to not take the food that they offer so Winnifred and I ate one together. She expected me to eat all five and when I told her one was enough she almost acted offended, but she took them back inside her hut for her family. I sat there for a long time playing games and singing with Winnifred, Irene, and a few of the other girls that live in the village. Winnifred's family has 2 goats which is a good source of food for these people so most of the people have multiple goats. She told me that they needed to eat and that me and her were going to take them out to eat. They had rope tied around their necks and she handed me one. We led the goats out to the garden to eat the grass. I left to go to Consey's to see what Emma was doing and seeing her plan for going back to eat lunch. I greeted Consey, her daughters Prisca, Barbara, Joe Ann, and the other kids that were around. Sunday, a boy that lives next to Consey, was outside reading something so I went and sat with him to see what it was. Sunday and I have become friends so whenever I am in the village I make a point to go and see him. He is 15 years old and has a brother named Tonny who is 22. They are both extremely nice and always want to talk. Sunday was reading a book composed of lots of different little stories. In my backpack I had a Bible storybook of Cole's so I got it out to let him see it. I had put a paper in the book of Bible verses that I wanted to read with Winnifred and Simon Peter. Sunday opened right to that page and so he went inside his hut and got his Bible and we looked up all of the verses and went through and talked about them. When I was leaving I told him to memorized John 3:16 and he told me he would have it memorized when I came back after lunch. It was fun sitting there with him going through the different verses and talking about them. Consey's and her daughter, Barbara was there and told me she would go look for Winnifred. While she was gone looking for her I ran into Sunday and he had memorized John 3:16. He needed a little help starting it but then recited it perfectly. I was surprised he learned it that quickly and was so glad how eager to learn he was! Barbara came back saying she was down at the stream so I walked to the stream but couldnt find her so I went back to Consey's. Sweet Barbara was determined to find her for me so we walked back down to the stream, to the rock quarry, to the boar hole, and then back up to her house and she was at her house. We must have just missed each other but I had run all around the village looking for her and of course she thought it was hilarious. She ran to meet me and jumped up on me. About that time Simon came home and so we sat by their hut and hung out. Sara came up and sat with us. Simon had gotten packs of little cookies that he gave to each of us. He told us we were celebrating us being there. He also gave Sara and I sprites. We tried to convince him to stop giving us food and drinks but he refused to listen to us. We told him he was way too nice and that giving us stuff was not necessary, but he just laughed. We spent a long time there sitting and talking to them. They are Catholic so we talked about the differences between Catholics and Protestants. Winnifred and I have been talking about reading the Bible together so she got hers out which was not an actual Bible but a Catholic song book. She told me what it was saying and we discussed that for a little while. I got out my bible and flipped open to John 3:16. She read it to me and I encouraged her to memorize it and she said she would. I told her on Monday morning we could recite it on the way to school together. Simon told me he would help her learn it. I want to start getting her to memorize scripture. I think it would be very easy for her to do she just needs the encouragement and discipline to do it. Winnifred and I went and got water from the boar hole together. Today she had a huge jerry can. After we filled it with water she wanted me to help her lift it and put it on her head so I did. She walked two steps and almost dropped it so she told me to try to carry it on my head. We both lifted it onto my head. It was so heavy. By the time I got back I felt a few inches shorter from the jerry can pressing down on me. Simon was so impressed that I had carried it and so was I! Winnifred and I went down to the rock quarry where a ton of the people in the village work. They sit there and break rocks and get paid for it. Winnifred's grandmother was down there so we went to help her. Winnifred gave me a hammer so I could break the rocks. She would put the rocks down and I would break them. We sang together while we worked and started memorizing John 3:16. I would say a part and she would repeat after me. I love being with Winnifred! She is so much fun to be with and she always tells me how much she loves me. Yesterday was such a good day doing life and working along side Winnifred , Simon , and everyone else! We have walked kids to school everyday this week and it has been so awesome to be able to spend time with them on our 20 minute walk there. We have made a routine of walking with them to school and then picking them up from school to walk home so we spend as much time with them as possible. I have really been trying to focus my attention on Winnifred and getting to know her. She loves playing and joking around but she is closed off when it comes to talking about anything serious but the more time we spend together the more open she has become! I know that I want to spend the rest of my time here getting to know Winnifred and Simon Peter, which is Winnifred's dad, better but I have not figured out exactly what God wants me to do with them. Two nights ago I prayed that God would just reveal to me my purpose with them and his plan. I prayed the same thing the next morning before I went out to the village for the day. 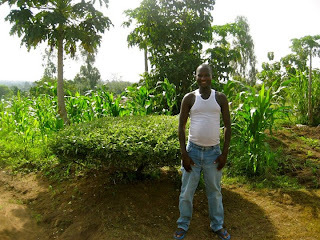 Yesterday morning when I went to Winnifred's home to get her for school Simon wanted to show me the bush in his yard that he had slashed (or cut) and was very proud of his work. He asked me if I would take a picture of him with it. I told him I would but I would have to come back later with my camera. After we walked them to school and came back home we left to go back out to the village and I forgot my camera. I ran into Simon and he asked where it was so I told him I would run back to the house and get it and that I would be right back. Jokingly he told me I had 5 minutes and told me he was timing me. I ran to the house and when I returned he said I was 3 minutes late. I took his picture and then took one with him. He was so proud! This is the picture he wanted me to take below! After I took his picture I went over to see Consey and Emma. As I was leaving he asked me if I would come back because he wanted to talk so of course I said I would come right back. When I returned I sat down with him and we pretty much talked about everything you can imagine. We talked about all the ways Uganda is different from America. I asked a lot about Winnifred and about how she does in school and just other things to get to know her better. He kept telling me how glad he is that we are here. He said that sometimes Americans have come and do not even want to touch them because they think that the Ugandans are dirty. He told me that our group does not make ourselves seem superior to them. He said sometimes he sits back and watches us play with their dirty kids who have been laying in the dirt and watches us work alongside the people here and through that he knows that Christ is in us and he can see it. We do not tell these people how things need to be done, but instead we learn from them and want to see how they do things. It was so cool that he said this. This has been our goal while here. We do not want to try to westernize them and act like we are better than them and have a better way of doing things. We want to work along side them and develop relationships while we work with them. When he said this to me I knew that we are doing with God wants us to do. We went on to talking about praying and reading the Bible. Both him and Winnifred have a Bible and he said they read it every night. I asked him if he prays and he told me he does all the time. When he wakes up, goes to sleep, and throughout the day. I was very happy to hear this because most of the people here think that they are only allowed to pray at church and no where else at any other time. I am glad to know that Simon knows and understands that he can talk to his Heavenly Father whenever he wants. He went inside his hut and got his Bible and a song book. He opened the song book and read one of the songs to me in Luo and then translated into English. It sounded a lot like the 23 Psalm. It was an awesome experience being able to do this with Simon. We picked the kids up from school and we sang the whole say back. Winnifred taught me a song on the way to school that goes like this: J is for Jesus, O is for others, Y yiyiyiyi is for you, you you you you you. We sang this over and over. I love being around her and learning about her and her life. I talk to her about Jesus every chance I get and she listens to what I have to say. Pouring into Winnifred and Simon Peter and just teaching them what God has revealed to me is definitely my purpose for while I am here. Both yesterday and this morning McCamy, Jerica, and I woke up at 6:30 because we found out that some of the kids that we have gotten to know start walking to school at 7 and we wanted to start going with them. We had no idea how far the school was away from the village. We were thinking it would take at least an hour there and then another hour back home because a lot of the kids walk long distances to get to school. We went not knowing what to expect. We got there to pick them up right at 7 and of course, being in Africa, the kids were not on time. We finally left with Maureen who Jerica has gotten to know really well, Winnifred, and a few others. By the time we got there our number of children with us had doubled. Winnifred was so happy that we were there to walk with them and held my hand the whole way there! I have been with her a good bit over the past week and have gotten to know her pretty well! The walk ended up only being about 20 minutes there and then 20 minutes back so it was not bad at all! About the same time it takes me to walk to one of my classes! We want to start walking with them everyday to be able to spend more time with them. Today we are planning on walking to the school when they get out at 5 so we can be with them going home as well! Yesterday, after walking with the kids to school we went out in the village later that morning. A few of us went to Consey's house and when we walked up she was hand washing her clothes so I asked her if I could wash with her. We washed once and then she put the clothes back in the bucket, poured more water in and told me to wash them again. She said that after three times of washing, then they are clean. If you only do them once or twice they are not clean. Sara came over and helped me wash. While we were washing Laurel and Anna left with some women to go cook. After we were done with the wash Consey wanted to go watch Anna and Laurel learn how to cook so we walked over to another woman's house. They were shelling g-nuts which are pretty much like our p-nuts. They also had some branches with leaves that were their vegetables and we pulled all the leaves off and put them in a basket so they could be boiled and cooked. Matt and Jamie gave us some phones to keep between our groups while we are out in the villages and while I was washing clothes with Consey the phone fell out of my shirt and went swimming in the water. I got it out as fast as I could but it definitely had water all in it. After I helped pull the leaves off the branches, Sara and I walked back to the house to put the phone in rice so it would hopefully soak up the water and still work. On the way back to see how the cooking was coming along we met some guys who were digging out in a field where they are building some type of wall or fence. One's name was Jackson and I can't remember the name of the other one (his name was a little bit difficult). They were both 22 years old and lived somewhere closer to town but were here working. They were curious about what we were doing here and so we explained to them what all we had been doing. Jackson told us a little bit about himself and told us that he works hard because he is fortunate to have a job and that he believes that God rewards those who do hard work. Jackson, Sara, and I had a very good conversation and talked about how God provides us with everything we need! The other boy that was there started talking about Obama and asked if we had ever seen him. After we told him we had not seen him in person he was confused because he explained to us that Uganda's president has been to Gulu several times and he has seen him. He said that someone in that position should take the time and make the effort to know the people better. Ugandans truly care about taking the time to get to know someone and develop relationships. They make an effort to spend time with people. Even if they have something scheduled like a doctor's appointment, they will skip it if a relationship is there to be formed. I told him that people in America are always in a hurry. That people do not usually take time to get to know someone else if it is not convenient for them. He told us that it is sad if we are living somewhere and we do not ever meet our neighbor. He said we need to go over and meet them and get to know them. How often do we live somewhere and never meet the person that lives beside us just because we do not take the time or make the effort? I would say that happens all the time. He said when we go back to America we need to be the ones that start the change because it starts with one person. I would say we can definitely learn from these guys! After we left the village yesterday afternoon, a few of us went back to Baby Watoto. We want to make it something we do once every week. Three of us went with the tiny babies, two with the infants, and two with the toddlers. I chose to go with the toddlers because thats where Kevin (my sweet special needs little friend) is. As soon as I walked up I saw Kevin. They were about to have snack so I sat down beside him so he could drink his juice. I do not know if he remember me or not but it definitely seemed like he did! I sat down and got a huge hug and started laughing so hard. He loves playing with my hands and likes comparing the colors of our skin. We spent about 2 hours there and Rebecca and I played with lots of toddlers. When it was time to go I walked inside to see if I could find Kevin to say goodbye to him. He was in a corner having a spell. He was kicking and screaming and crying. I walked up to him to see if I could talk to him and he immediately stopped crying, jumped on me, wrapped his legs around me, and gave me the biggest hug I have ever gotten. It was the sweetest thing ever and I love spending time with sweet Kevin! Yesterday was Tristan's (Matt and Jamie's son) 4th birthday and he made sure we knew that all day! haha when he woke up yesterday morning and screamed "IM READY!" We had a Cars themed party for him and Matt cooked a good southern meal of fried okra, fried chicken, and vegetables. It was so good! In your relationships with one another, have the same mindset as Christ Jesus: Who, being in very nature God, did not consider equality with God something to be used to his own advantage, rather, he made himself nothing by taking the very nature of a servant, being made in human likeness. And being found in appearance as a man, he humbled himself by becoming obedient to death- even death on a cross! Therefore God exalted him to the highest place and gave him the name that is above every name, that at the name of Jesus every knee should bow, in heaven and on earth and under the earth, and every tongue acknowledge that Jesus Christ is Lord, to the glory of God the Father. Yesterday we experienced our first real Ugandan church service. We walk into loud, joyful, singing with dancing and lots of energy. The church was packed and we walked in the back and there were no more seats, but then the ushers took the mzungus up to the very front and brought us a bench to sit on. The music was my favorite part of the whole service. The first song they sang was in Luo which is the language they speak here but after that they sang Because He Lives. There was no holding back with the people at this church. It was loud and powerful. I thought it was cool that they sang this because this song became one of my favorites after David Crowder sang it at passion this past year and then I got his cd and this song is on there as well. It is such a great song! We are nothing without Christ. It is because of him that we are alive. Christ does not need us, we need him! Today we were able to go to the land that will one day be Abaana's Hope and see the progress that has been made in the past two months since they bought the land. It is about a 45 minute drive from Matt and Jamie's house in Gulu just because of how bad the roads are along the way. It was a very rough ride dodging potholes and swerving to try to take the smoothest path possible. We were able to see what all was being done and the plans that they have for the area. It was very cool being able to see the very beginning stages of this ministry, knowing that it will turn into something so great in just a few years! They have cleared a good bit of the land and have started growing crops. A boar hole should be coming in soon and once they have water, the first building will start to be constructed. God is being glorified through this ministry in every way! We can begin to pray over the children who will be living in the homes here! We have not had power for the past 24 hours so I have not been able to blog! A lot has been going on the past 2 days! Yesterday we woke for another day of the kid's program. I was in charge of the Bible lesson. Each day we review what we talked about the day before and then build on that. I talked about how God loves us so much that he sent his only son, Jesus to die on the cross so that if we believe in him we will spend forever with him in Heaven. Pretty much John 3:16 in extremely simplified terms so that the kids could understand. It is assuring to think about how God is the only one capable to changing the hearts of the kids and everyone else we talk to. Salvation is found in no one other that Jesus. Nothing I say can save someone and I praise God for that knowing he is in complete control! I was able to be with Winnifred for a while again yesterday! 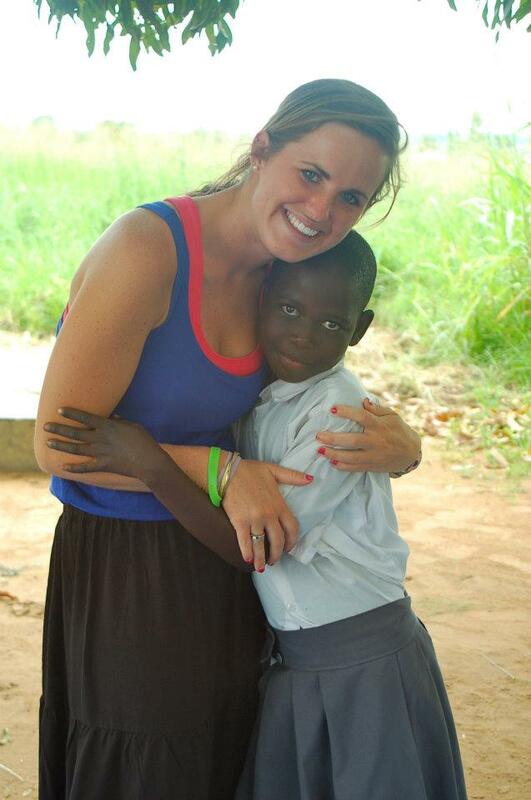 She was unable to go to school again because of the unpaid school fees so she got to hang out with us again! This is her in the picture below. The kids caught on really well to the songs yesterday. They were able to sing one of the songs we have been singing called Baby Jesus all by themselves in English with the motions and everything! Later when we went back out to the community when we would be walking around we heard kids singing it to themselves as they worked. God is working in mighty ways! In the afternoon after lunch we went back out to the tribe. I was with Barbara who is Consey's daughter that I talked about earlier. She wanted me to go to the boar hole to fill her jerry can with water. What seems like an easy task is actually very hard. The cans weigh so much when filled with water and then the Ugandans carry them on their heads. So I had a can and Barbara also had a can. We filled them with water and Barbara took hers, put it on her head and expected me to do the same. I struggled to get the can to my head and by the time we got back to her hut I had spilt water all over me and of course Barbara was completely dry. Her whole family thought it was hilarious. Maybe I will get better as time goes on! Today was the last day for the children's program. We basically reviewed everything we had been doing the past few days. My relationship with Winnifred is growing each time I am with her. We even have a handshake now haha! It was a shorter day because we had plans to go into town to a place called Living Hope. It is a place for women who have had a lot of suffering in their lives due to different situations to come and work. We toured the place and saw how women make peanut butter, bags, little stuffed animals, feminine pads, and many other things. In Uganda when girls start their menstrual cycle they usually do not have any way to stop the blood flow and so then they stop going to school, so these women make feminine pads from paper and other things to sell to girls so that they can continue with their schooling. It is crazy the things we take for granted! When we went in the sewing room to see how the ladies made the stuffed animals I met a lady named Agnus. She was a sweet lady who wanted to teach me how to sew. I told her I would probably mess something up if I tried it! She asked me if I was a believer and when I told her I was she got so excited and said she was too and that she had been for 5 years! I wanted to talk to Agnus more but we were having to leave. She asked me to pray that she learns more English somehow and I told her I would so that is something specific everyone can be praying for! Today was a hard day and a lot happened! Be praying over everyone here! Today was the second day of our children's program and it went better than it did yesterday! The kids were so much more receptive to what we had to say and wanted to join in with the songs and games we had for them. I really prayed last night and this morning that God would prepare the hearts of the people I would talk to today and that he would specifically put the person or people in my path I needed to talk to. After the bible lesson and songs I went and sat with some girls who were about ten or eleven. They had their school uniforms on so I was asking them about why they were not at school. It is extremely common here for kids to get sent home from school for not paying their school fees and/or not bringing the supplies that they are required to have. This was the case for these girls I was talking to. They did not seem too upset about not being at school and told me that they were having more fun with us anyways and they did not really want to be at school in the first place. After getting to know them a little bit one of the girls got up so I ended up focusing my attention on a girl named Wilfred. Wilfred asked me if I had any sisters on the trip and when I told her I did not she sweetly asked me if she could be my sister and of course I told her I would absolutely love for her to be my sister! This led into a discussion about her being my sister in Christ. She told me that she not only wanted us to be sisters but to be best friends as well! Saturday is the day Wilfred washes her clothes and I asked her if I could come help her wash her clothes in the creek. She looked at me and laughed. She was so happy that me, a mzungu, wanted to come help her wash her clothes. God definitely specifically orchestrated Wilfred and I to meet and talk today. When we pray and expect God to do great things, he does far beyond what we can ever imagine! After the children's program we came back and took a break for lunch. Jamie planned for us to go into town to visit Baby Watoto which is a place for babies who are abandoned or orphaned due to poverty or many other different situations to come and receive care and a place to live until they are old enough to move up to the children's village or go and live with relatives. Baby Watoto is for children from the age of 0 to 2 years old. We were able to go in and hold the babies, feed them, change their diapers, and just play with them. They house so many babies that they welcome the help, and we were happy to be there! We went around to see the different age groups of children there. 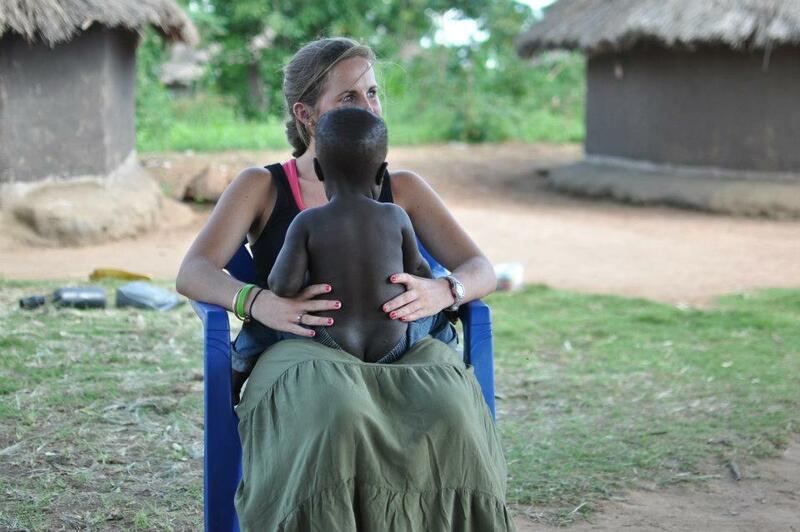 They told us that they do not have special needs children at the Gulu location. They are sent off to a different location to be treated there. 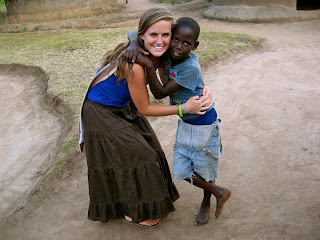 However they did have one boy with special needs that for whatever reason was at the Gulu location. They told us that he was almost blind. Our group went outside where all of the kids were to play with them and I saw the boy with special needs walking inside so I followed him inside to see him. There was one lady that was with him to watch him but no one else was really around. She told me his name was Kevin. Kevin was 7 years old and so so sweet. He appeared to be autistic and had other physical disabilities as well. The woman who was with him told me that no visitors really ever come to see him and that she was so happy for him to have a friend. I told her about my major and what occupational therapy was and explained to her that I wanted to work with kids with disabilities so that is why I wanted to come see Kevin. I guess she trusted me because she left Kevin with me the rest of the time we were there. He was so full of love and I had such a fun time being with him! God makes no mistakes and made Kevin the way he is for a reason! God is glorified through every situation and Kevin is his child! We must remember that God is always in complete control! Today was the first day for the kids program. We arrived at the mango tree which was our meeting spot at about 9 this morning the kids being on Uganda time, not many of them were there yet. I went to get 2 children I saw in the distance to bring them to play with us. One was a precious boy named Obama. Like many of the children in the tribe, Obama was a naked little boy no older than one year old. He became my little friend. I absolutely love that boy. He didnt speak at all but he just walked around and played with Cole. He was a good way to begin my day. This is him in the picture! This is later in the day when he actually has some pants on! The kids program went really well! We started off with a Bible story talking about how God made them and how much he loves them. We also sang, made dolls out of Matoke leaves, and played lots of games. Although most of the kids did not speak much English because they are unable to attend school, it was a very successful program! After the program we went back and ate lunch and had a time where people on the team could share their testimonies. It is such a good way to truly get to know someone. Everyone on the team has been such a blessing and I have enjoyed getting to know everyone! Around three is when some of the kids are getting back from school and going to dig in their gardens so we went back out to the tribe around this time so we could see the kids we were unable to see at the program and to continue to develop relationships. I talked to Consey for the majority of the time. She is such a sweet lady and loves us being there to hang out with her 7 children. God is so great and has revealed himself in amazing ways while we have been here! Wow! We have been in Uganda for 3 days now! It was definitely a long few plane rides here but we made it!!! We left Atlanta and had about an hour plane ride to Washington, DC, then to Brussels, Belgium, and then landed in Entebbe, Uganda. After landing in Entebbe we drove to Kampala, Uganda and spent the night in a hotel. We left early the next morning and had a six hour drive to Gulu which is where we will be staying with Matt and Jamie for the rest of the time we will be here. We saw so much on the ride over that the time flew by. Traffic laws means nothing here and the crazy driving made it that much more interesting. We learned that if a car hits someone crossing the road, the driver should just keep going and not stop. That is different from the US for sure. The past few days have been such a blessing. Matt, Jamie, and their children Tristan and Cole are such awesome people and an amazing family. I cant wait to spend a month here with them! On Saturday we were able to talk a little about what we wanted the next month to look like for us and how we could use our gifts and talents to glorify Christ and make his name known in the places where we would be working. Our main focus is developing relationships with the people living near the Easts house and sharing the love of Christ with them. Saturday afternoon we split the group up and half of us went with Matt to tour Gulu. We drove around the town just to be able to see where we would be the next month. When we returned we went out to the huts of the different tribes where we will be spending the majority of our time. We went from hut to hut meeting the men, women, and children living in each one. Everyone was so welcoming and loved talking to the Mzungus. All of the kids would gather all around us and stand there and laugh. I mean I guess we are pretty funny looking. Emma and I stayed with a particular family for the majority of the day. We met Consey, a woman with 7 children and all of them girls! We were able to go down to the creek with two of her children and help wash their clothes. Emma and I were not the best at this task. Every time we asked if the clothes we were washing were clean they would reply with a sweet but firm no and then take the clothes from us and clean them themselves. I resorted to hanging the clothes on the bushes after they were washed because Jo Anne ( the little girl I was helping) told me I was much better at doing that. They loved us being there with them. By the end it seemed that all the kids in the tribe had made their way down to the creek to play with us. It was a great way to start off our time here and I just know that God will further the relationships everyday and use them for His glory! Today (Sunday) we woke up and went to Grace Baptist Church about 10 minutes away from Matt and Jamie's house. Jamie was hesitant to take us there because she heard that it was pretty much like a church in the US and was even started by a man who moved to Gulu from the US. It was similar in some ways but was also very different. We sang songs in both Acholi, which is the native language here in Gulu, as well as in English. The worship songs were by far my favorite part of worship this morning. The children were dismissed from the main service and met outside to have a Bible study of their own. Towards the end they started to sing and their voices could be heard from inside the tent where we were meeting. They were so full of joy and meant every word they were singing from the bottom of their hearts. It should make us think about how our worship style needs to be refocused. Are we just singing words or do we sing with JOY from the bottom of our hearts? After church we came home, ate lunch and then went back out the huts. Emma, Laurel, and I were together the whole time. When we first got there we met Simon Peter and Fred. They insisted that they take us around the tribe so we could meet everyone. This was perfect because we decided to do a VBS style program everyday for the next week for the kids who either do not go to school or ones that are too young to go to school. So we were able to talk to all of the moms in the area and meet their kids and tell them about the program. We had lots of help to tag along with us with five kids on each arm! We absolutely loved it! Each night we have had devotions to talk about our day, what we have learned and a time to discuss When Helping Hurts which is the book all of the interns read before we came. Last night one thing we talked about was the answer we give when answering the question Why did Jesus come to earth? When answering this we tend to make the answer all about us. We say "Jesus came to die on the cross to save us from our sin" which is true but Jesus actually came to glorify his Father. He came to do the will of his father. It is not really about us. Absolutely EVERYTHING is about glorifying God and making his name known, that is it. If we truly believe that the Lord is sovereign, then we also believe that suffering, death, and things we consider to be "bad" are glorifying to God as well and are all to make his name known. John 6:38 says "For I have come down from heaven not to do my will but to do the will of him who sent me."